The most beautiful view opened before us, not grand, but of perfectly lovely beauty. In the extreme distance was the snowy range of Olympus (Uludag near Bursa), and before it a series of fine mountains, with their feet bathed in the most placid of lakes, the ancient Ascania, which is about ten miles long and four in breadth. At the southern end of the lake, beautifully situated, stood the ruined towers of the many times famous Nicaea. 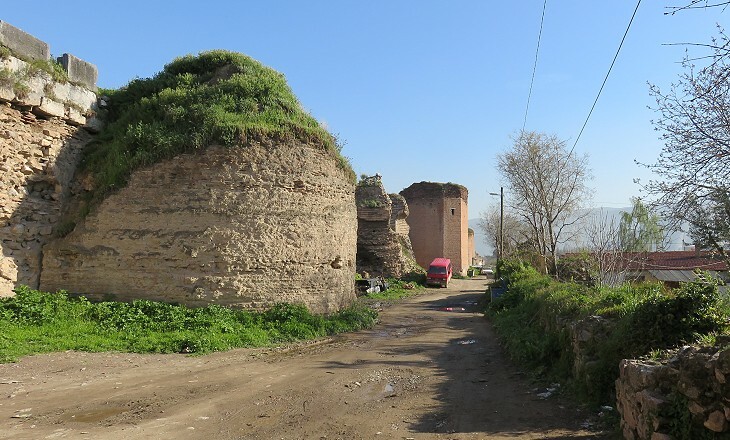 (..) Entering through a hole in the walls of this famed and fated city, we had still another mile to travel through fields and mulberry plantations before we arrived at the village of Isnik, a small place standing within the walls, which form a circuit of four miles around it. From the summit we had a fine view of the Lake Ascanius and the beautiful plain by which it is bounded. We marched for several miles, hovering about the shores of the Ascanius, and passing in our way through an immense forest of olives. 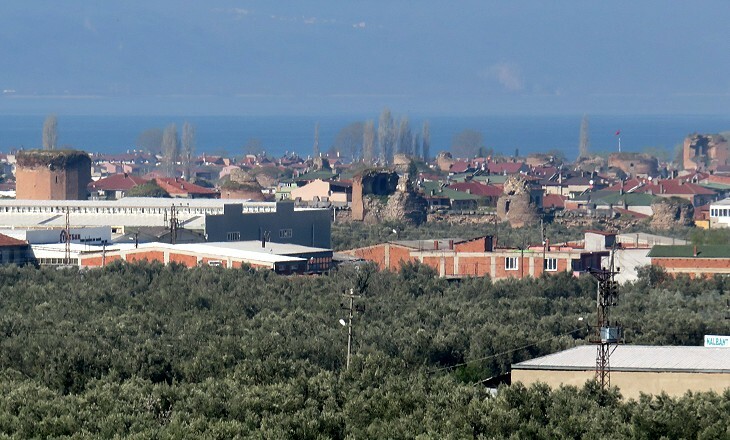 Nicaea/Iznik, is situated in north-western Turkey, on the shore of a lake close to the Asian coast of the Sea of Marmara, in the historical region of Bithynia. 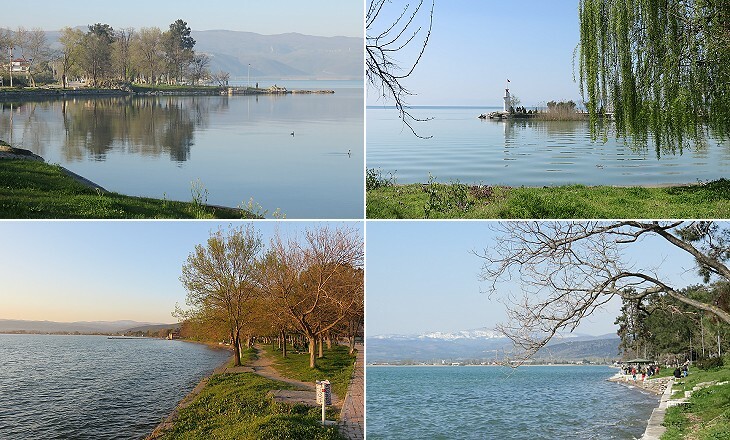 Iznik has not experienced a large increase in population and it is still surrounded by its ancient walls. Previous to descent we had a noble view of the lake Ascanius, or Iznik; and around a sedgy plain, at the head of it, is a skreen of wooded hills. 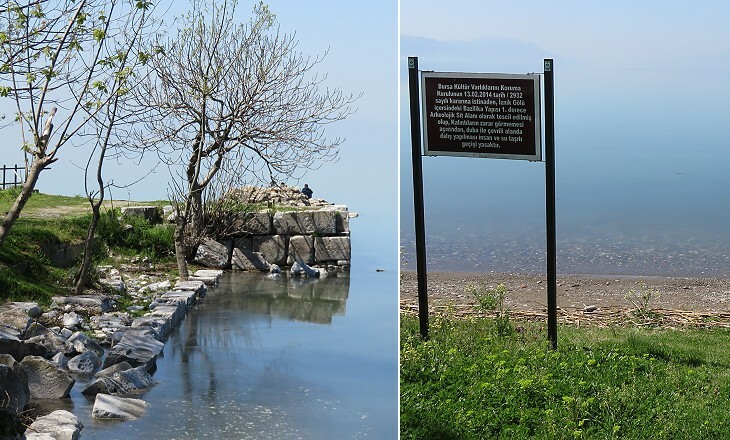 A mythical event which occurred near the lake is narrated by Propertius, a Latin poet of the Ist century BC: "Fortune often attacks the imprudent lover": so might the River Ascanius (which flows out of the lake into the Sea of Marmara), harsh to the Argonauts, tell you. The wretched wanderer Hercules suffered this misery, and wept by the wild River Ascanius, on an unknown shore. (..) Here the band of heroes landed on the quiet shore, and covered the ground with a soft layer of leaves. But (Hylas) the young unconquered hero’s companion strayed far, searching for the scarce waters of distant springs, (..) moistened apples hung from the wild fruit-trees, and all around in the water-meadows white lilies grew, mixed with scarlet poppies, which he now picked with delicate fingers, childishly preferring flowers to his chosen task, and now bent innocently down to the lovely waves, prolonging his wandering with flattering reflections. At last with outstretched palms he prepared to drink from the spring, propped on his right shoulder, lifting full hands. Inflamed by his whiteness, the Dryad girls (tree nymphs) left their usual throng to marvel, easily pulling him headlong into the yielding waters. Then, as they seized his body, Hylas cried out: to him Hercules replied, again and again, from the distance, but the wind blew his name back, from the far waters. Propertius - The Elegies - I:20 - Prose translation by A. S. Kline. 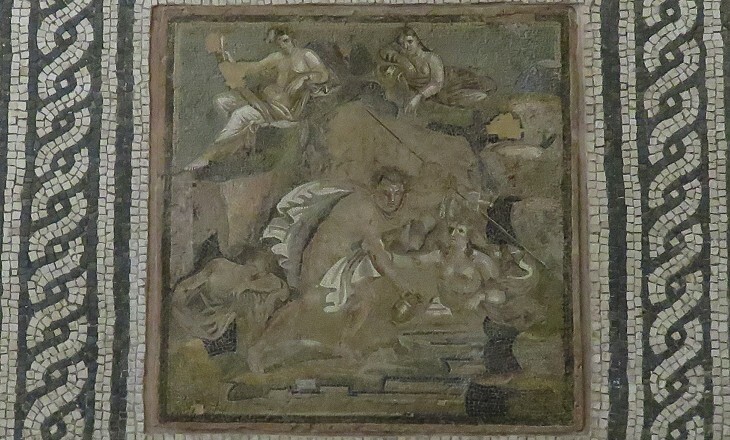 See another mosaic portraying poor Hylas at Alanya. 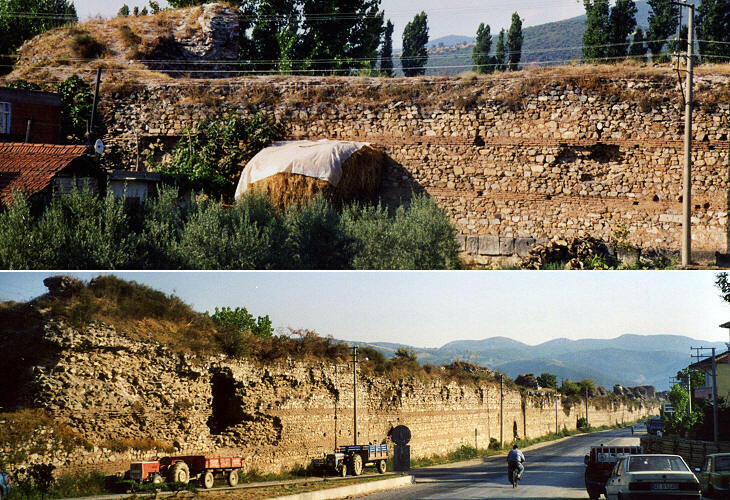 The city of Nicaea (..) is encompassed with very fine walls, which are almost entire (..). The present town, which is much like a village, has not above three hundred houses in it, and there are not more than twenty Christian families in the place, the greater part of which are Greeks. They have no trade but that of silk, which is bought up by the merchants, and sent either to Boursa, or to Constantinople. Campi Nicaeaeque ager uber aestuosae. (Let) the rich land of sweltering Nicaea (be left behind). Gaius Valerius Catullus - Carmen 46. Wednesdays see Iznik hosting the regional food market and whilst the produce is very similar to Istanbul, there are few things that add a local flavour. Artichokes, the buds of the large, prickly thistle are both cultivated and found wild around the region. Seen as natural hedges for small vegetable plots or springing up along the shore of the lake, they are cut down when small and sold intact. In this fashion, baby artichoke hearts can be cooked and eaten or preserved for later use (from the internet edition of Sunday's Zaman, a Turkish newspaper - May 26, 2008). The area around the town was, and still is, very favoured from an agricultural viewpoint. Modern Iznik has a rather urban aspect inside the ancient walls, but outside them one immediately feels to be in a pretty rural environment. Mulberry trees have been replaced by orchards producing fruit (grapes, peaches, cherries, plums, pears, apples, etc.) and vegetables (tomatoes, artichokes, beans, broccoli, etc.). 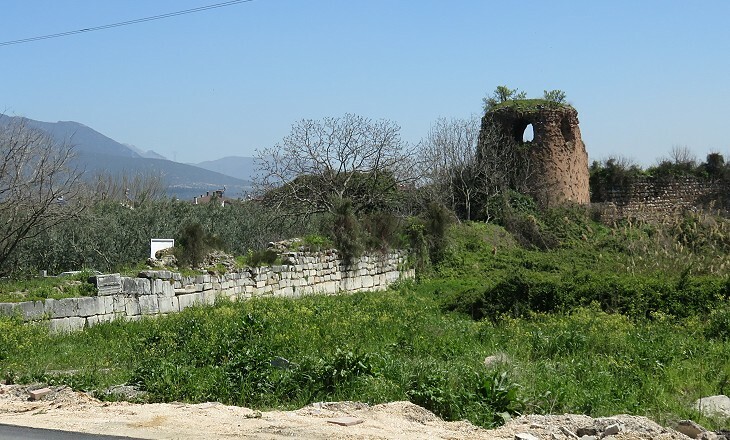 The remains of the aqueduct which supplied Nicaea with water are visible immediately outside the eastern gate. The road along the aqueduct leads to a low hill which has a commanding view over the town. On April 12, 1204 the Crusaders occupied Constantinople and declared Baudouin of Flanders Emperor of Romania (the name then given to the Eastern Roman/Byzantine Empire). The most important Byzantine families had large possessions in the provinces and after the fall of Constantinople they fled there: the Comnens, with the help of the Georgians, founded the Empire of Trebizond on the Black Sea, the Angeloi managed to retain most of Epirus, the Lascaris founded in Nicaea an empire which they claimed to be the legitimate heir to the Byzantine Empire. 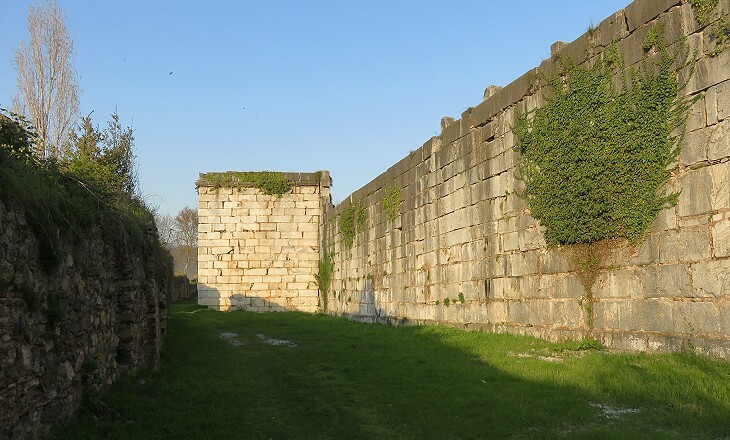 Theodor I, the first emperor of Nicaea, decided to strengthen the defences of his capital by building an external wall, at a distance of 20-30 feet from the existing one. The western side of the walls, facing the lake, shows clear evidence of the XIIIth century enclosure, but not of the earlier Roman walls. 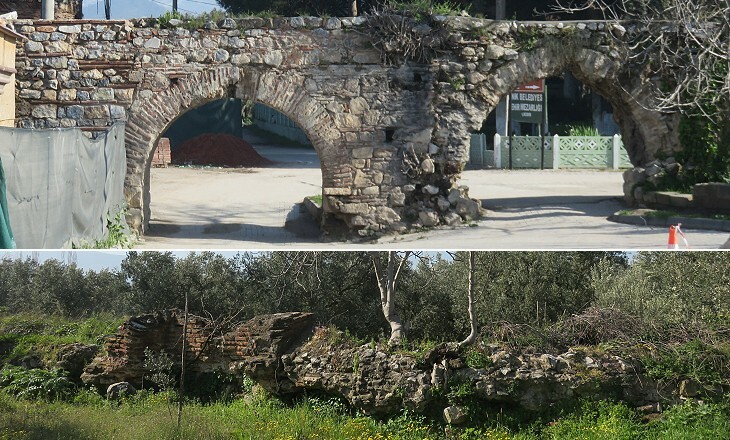 As a matter of fact a section of the ancient wall branches off the Byzantine walls and goes towards the lake. 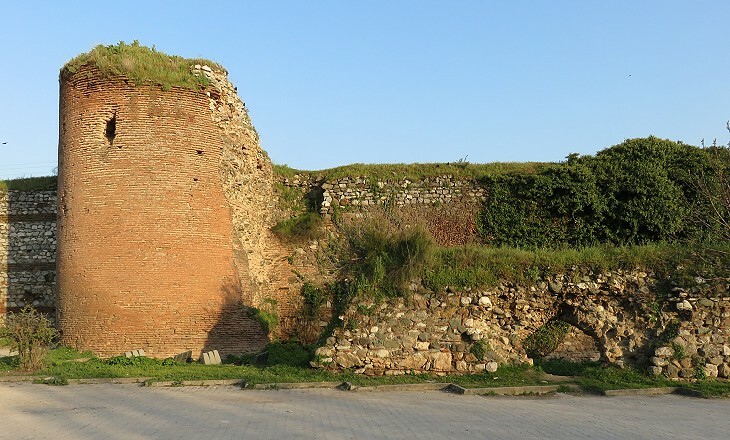 Archaeologists believe that the western part of the ancient town was occupied by a palace, where possibly Emperor Constantine chaired the ecumenical Council he summoned at Nicea in 325 (rather than in the church of Hagia Sophia). Turkey is prone to earthquakes and other seismic events. 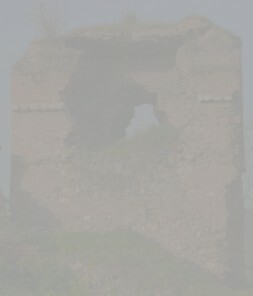 The western part of the ancient town might have been affected by negative bradyseism, i.e. the gradual descent of the Earth's surface, caused by the filling of underground volcanic chambers, similar to what occurred at Simena.